Kay has deftly noted in a past comment that, notwithstanding my extreme unease with babies and children, they constantly surround me. I guess, when you're 31, people around you procreate like there's no tomorrow. You can't do a damn thing about it except smile and pretend you also adore their spawn. While I may not love babies, I do love creativity, and I am, of course, very happy for my friends who choose to reproduce. I got the coolest baby shower invitation the other day. I think it is my favorite of all time. Well, so far, that is. I know I'll be getting more. People just keep popping out these little suckers. And I do give pretty sweet gifts. 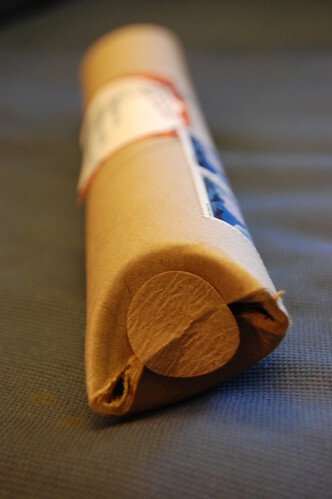 I found this tube in my mailbox. 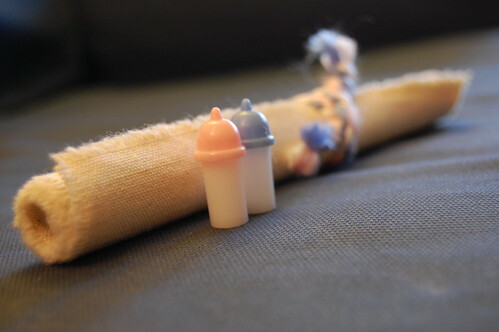 I opened the tube to reveal a tiny pink baby bottle, a tiny blue baby bottle, and some rolled-up burlap with pink and blue string. I untied the string to reveal this! I scratched out names and other identifying info, but hopefully you can still tell how awesome this invitation is. Sok is an old co-worker of mine from the Green Giant. At 6'9", Sok is quite the giant himself, and Mrs. Sok is a 6-foot-tall former model. They are going to have some beautiful towering twins! 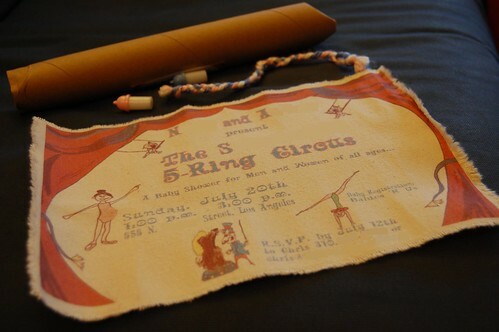 With the addition of a little boy and a little girl to their current family of three, they will indeed have a five-ring circus! That is way cool. I just wonder who had the time and energy to put those things together?? love a cool invitation. always sets the tone! what a freaking awesome invite!